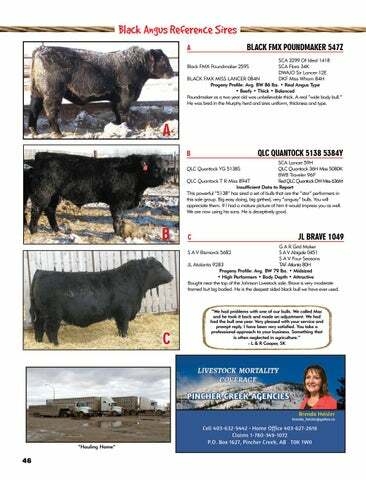 SCA 3299 Of Ideal 1418 Black FMX Poundmaker 259S	SCA Flora 34K DWAJO Sir Lancer 12E Black FMX Miss Lancer 084N	DKF Miss Wham 84H Progeny Profile: Avg. BW 86 lbs. • Real Angus Type • Beefy • Thick • Balanced Poundmaker as a two year old was unbelievable thick. A real “wide body bull.” He was bred in the Murphy herd and sires uniform, thickness and type. A SCA Lancer 59H QLC Quantock YG 5138S	QLC Quantock 36H Miss 5080K BWB Traveler 96P QLC Quantock T R Miss 894T	Red QLC Quantock DW Miss 636M Insufficient Data to Report This powerful “5138” has sired a set of bulls that are the “star” performers in this sale group. Big easy doing, big girthed, very “angusy” bulls. You will appreciate them. If I had a mature picture of him it would impress you as well. We are now using his sons. He is deceptively good. G A R Grid Maker S A V Abigale 0451 S A V Bismarck 5682	S A V Four Seasons JL Atalanta 9283	TAF Atlanta 80H Progeny Profile: Avg. BW 79 lbs. • Midsized • High Performers • Body Depth • Attractive Bought near the top of the Johnson Livestock sale. Brave is very moderate framed but big bodied. He is the deepest sided black bull we have ever used.